It’s Monday afternoon. 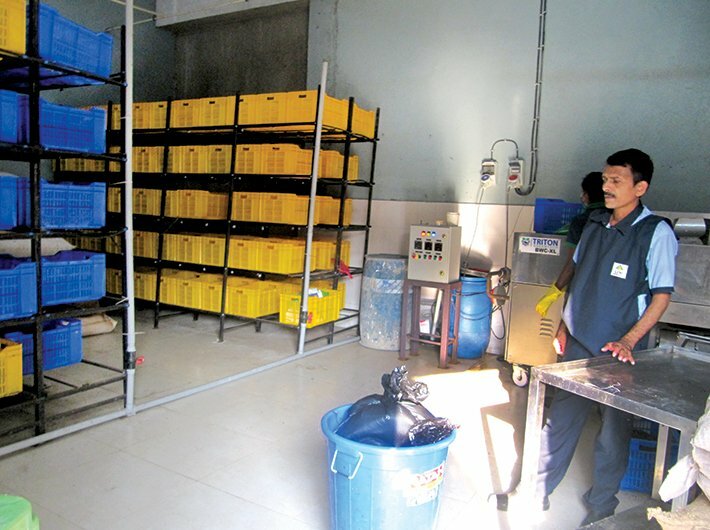 The otherwise spick and span organic waste converter (OWC) room in the backyard of Mindspace IT Park in Airoli, Navi Mumbai, is emitting a strong odour – like that from leftovers. People carrying big plastic containers full of wet waste are running to and fro from the building’s canteen. “Sunday being a holiday, no processing took place, hence the odour from the slurry. When wet waste is processed daily there is no smell,” says Nikhil Agrawal, director and CFO, Environmental Greenliness, a waste management company that also works in the area of alternate energy systems and organic food. At the IT SEZ, 500-600 kg of wet waste is processed six days a week. Sawdust is added to remove the moisture from the wet waste and the mixture is poured into the bio waste converter (BWC) machine. The machine chops and churns the waste for three-four minutes at a temperature of 45-55 degrees. The resultant dark brown colour compost is then transferred into open plastic containers fitted with pipes and a fogging mechanism at a temperature of 30-35 degrees. The mixture is then left to cool down at room temperature. The same process is repeated every day and the final compost, which has an earthy smell, is ready within 12-15 days. “The BWC machine shortens the composting period by more than 80% and the compost is ready in just 10-15 days. This works best for commercial establishments and large residential complexes which generate large amounts of wet waste every day. Sawdust is procured at Rs 45 per 5 kg,” says Agrawal. “As a substitute, newspaper can also be mixed [with wet waste] but the ink can disturb the composting properties. Once ready, the compost is sent for testing to a government-approved lab for ascertaining acidic levels and ruling out carcinogenic substances of soil which can harm the plants,” explains Poonam Huder, a waste management expert and founder of the company. Huder got involved with waste management two decades back when her doctor said that the reason for her young son frequently falling sick was due to the dumping ground in the vicinity. “What I saw there changed my perspective towards waste. I realised that an X person was making a living out of waste generated by Y. It was not right. I started working with an NGO in the area and ended up getting TB,” she says. Moreover, Huder realised that most of the NGOs worked in their own interest. So in 2000, she established Environmental Greenliness to provide sustainable environmental solutions. As city administrations across the country are battling with disposal of garbage, the waste management sector is offering huge business opportunities to companies like Environmental Greenliness. “Environmental Greenliness customises its machines as per the client requirements and works with synergising resources to reduce waste in city,” says Agrawal. Not only this, the company is even providing training and soft skills to rag pickers and inducting them in the formal sector. In 2016, after a massive fire at the Deonar dumping ground in Mumbai many rag pickers lost their livelihood. The fire resulted in emission of highly poisonous gases and made it impossible for the rag pickers to resume their work. These people had no other source of income. By getting into the formal sector, rag pickers can have a regular source of income. The company also manufactures waste management machines and customises them as per their client requirements. Among the clients are business houses and residential complexes. “Specific training in waste segregation, composting and bio-methanisation techniques using personal protection gears is provided to site supervisors, co-ordinators and labourers,” says Agrawal. But after the initial handholding of six-seven months, things are back to square one at these places. Sometimes, these enterprises hire NGOs to run their waste management system but as soon as their contract ends, they go back to their old methods. Mobile pits are provided to societies with a space crunch. “Very often we are asked about the benefits of putting wet waste in a pit so we show them the compost and its utility”, says Agrawal. “Waste management is a symbiosis of different stakeholders in which everyone works in their own interest to ensure that waste is disposed of properly,” says Agrawal. Dry waste is handed over to scrap dealers, who segregate it and earn money by selling it. “Truck load volumes of paper go to Vapi and Surat, plastics to Mulshi or Malegaon and Pune outskirts. Scrap metal is sent to aggregators in the local market. Non- recyclable waste like sanitary napkins, diapers, medical waste, thermocol, etc., goes to BMC,” adds Agrawal. “They got blasted and threatened by the residents. When they were levied a penalty of Rs 5,000 per day by the facility management for not segregating waste there were about 25-26 defaulters. When we tried to ascertain the reasons for defaults we came to know that either the maids were changed or new tenants had moved in. Now every waste bag has the flat number printed on it. Our staff sends us snapshots of defaulters on mobile every day, which is forwarded to the facility management every day. The number of defaulters has reduced to 1-2 per day and there are no repeat offenders”, says Agrawal. A sensitisation campaign was also held in the society for young people on segregation, recycling and composting. “Today only 10-15% of their entire waste is going to the dumping ground. We could do this only with the help of facility team of building”, he adds. “Waste management is the most disorganised sector and requires continuous engagement. For the massive scale that the BMC is working on, it is difficult for them to have hands-on control. It has to come from citizens,” says Agrawal.